Discover the wonderful Bordeaux region of France and the world’s most famous Vineyard. Have an exceptional riding experience. Not only will you enjoy the company of great horses but you will explore the most famous wine lands in the world, riding through prestigious vineyards including the Médoc, Côtes de Blaye, Côtes de Bourg, Fronsac, Lalande de Pomerol, St Emilion, l’Entre deux mers, Premières Côtes de Bordeaux, Graves and Sauternes. In addition to this the ride takes you to some beautiful areas of historical and cultural interest such as the Citadelle de Blaye, built in the 18th century by Vauban, the medieval city of Saint Emilion, the Chateau de Rauzan and the English bastide of Cadillac dating from the 13th century. 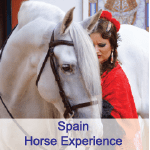 Its also great to know that you will always be accompanied by two certified equestrian guides on this great wine lovers’ adventure. In addition to the historical sites you will have the pleasure of gourmet picnics with delicious local food and of course some great riding experiences, whether its galloping along beautiful trails or following along a winding riverbank. These are wonderful trips for riders with an interest in history and architecture. Riders must be at ease at all 4 paces across varied, uneven terrain and be in good physical condition. You must be secure in the saddle and be comfortable riding for long hours. Rider weight limit: 220 lbs. / 100 kilos. The horses are pure or cross-bred Paint, Arabian, or Thoroughbreds and Warmbloods. They live in a 70 acre field with the herd all year long, and most of them were born at the equestrian farm. They are well-behaved and suitable for all types of rider. The saddles are comfortable trail saddles, saddlebags, poncho, and water are provided and all horses are ridden in simple bridles with “myler” type bits. This is an exciting trail ride for lovers of French wine. The trail leads you from Moulis in Médoc to Sauternes, passing by fascinating vineyards and many points of historical interest. Plenty of riding and great wine tasting experiences. Arrival at Bordeaux Airport for the set time transfers by 6.30pm. You will be driven to the B&B ‘Domaine de Quittignan Brillette’ in Moulis en Médoc for your first dinner and overnight. Breakfast is at 8.00am and you will be transferred to the horses at around 9.00 am. By 10.00am we will be on horseback, riding through a flat landscape between vineyards and forests. The group will enjoy a picnic on the borders of the Gironde with a tasting of a Médoc after lunch. We will cross the Gironde, with our horses, on a ferry, heading towards Blaye. The journey crossing is around forty minutes. Upon arrival, you will ride to the Citadelle Vauban (18th-century citadelle). Overnight at the Porche hotel. The day starts the same as yesterday and you will be riding by around 10.00am. The ride today leads you through the Côtes de Blaye and Côtes de Bourg region, crossing a hilly landscape. The picnic today is at Castle Lamothe and enjoy a tasting of the Côtes de Bourg. At 3.00pm it’s time to get back on the horses and ride towards Cubnezais over a flatter landscapes, travelling through some humid areas where there are no vineyards. Tonight the evening meal is at Gravette’s vineyard with a tasting during the meal. Overnight on site. Today you will be on your horse by 9.30am and ready for another day in the saddle and to experience more delicious wines. The region today alternates between vineyards and small forests and you will follow a route leading to the Castle Mayne Veil. Here you will have a picnic and a tasting of Fronsac wine. Once back on the horse you will ride towards Libourne, passing through the famous region of Pomerol. You will leave the horses at Pomerol. At the Castle Belles Graves we taste the famous wine Lalande de Pomerol. This evening is spent at the La Tour hotel in Libourne. After breakfast we ride in the direction of Saint Emilion, passing through the famous properties of Château Pétrus, Cheval Blanc and Château Figeac. Todays picnic is at Saint Emilion with tasting of the wine, followed by a free visit to the city of St Emilion. In the afternoon you will leave St Emilion and ride through the large valley of Dordogne, arriving near the Chateau Courros for a wine tasting. Afterwards we leave the horses and transfer to Saint Jean de Blaignac and overnight in a B&B. We are now you are in the region of the l’Entre deux mers which features wonderful varied landscapes with hills, rich woodlands and beautiful wineries. We will pass next to the 13th-century Castle of Rauzan. In the afternoon we ride into the hilly areas where the vineyards alternate with forests. We reach the Castle of Broustaret with its Bed and Breakfast. Dinner tonight is in the city of Cadillac where we taste the Premières Côtes de Bordeaux, and later enjoy a night time visit of the city. This morning there are some high hills to be crossed before you reach and pass through the valley of Garonne, coming to the vineyards of Graves and Sauternes. Today’s picnic is at the Castle of Myrat, the Count of Pontac will show us around the castle before inviting us to taste the golden-coloured wine. In the afternoon gallops between the vineyards and forests will lead us to Sauternes. During dinner we will taste the wine of Graves before spending the night at the hotel. After breakfast, it’s time for your transfer back to the Bordeaux airport. There will be one group transfer today. Please note that this program is for information only and the itinerary may be modified according to the availability of the hotels, the weather, any other issues and the some sights maybe closed for various reasons. You will stay at various hotels and B&Bs during this trip. Price is based around sharing a double or twin room, though single rooms are available for a supplement. Nearly always there are bathrooms joined onto the bedrooms. Full board meals are included. Dinners are in a traditional French regional style taken in restaurants and hotels along the route. Picnic lunches tend to be country meals involving cuts of cold meats, cheese and various mixed salads (including local wine). Please note that appetisers and drinks are not included with dinners. Single supplement €360.00 subject to availability. Please advise when booking.